1970 marks the start of a new epoch, with Perstorp AB now a public company listed on the Stockholm stock exchange. Powerful international expansion is launched to secure leading positions in chemicals, plastics and laminate. Perstorp starts polyol production in the US and acquires Hammarplast, a Swedish consumer plastics company. Pernovo, Perstorp’s own business development company, adds a long list of innovative businesses in such diverse fields as plastic additives, analysis systems and noise abatement. Expansion continues in the 80s with the development of additional chemicals, and Perstorp invents the laminate flooring called Pergo (from Perstorp + golv, the Swedish word for floor), which becomes a worldwide product within a few years. Scandinavia’s largest injection mold, with 3,000 tons of clamping force, is set up in 1985 in Perstorp to product the soon-familiar green refuse bins. The consumer plastics business is divested at about this time. The Group is organized into nine business areas (plus Pernovo): Additives, Biotec, Compounds, Chemitec, Electronics, Components, Plastic Systems, Surface Materials and Specialty Chemicals. 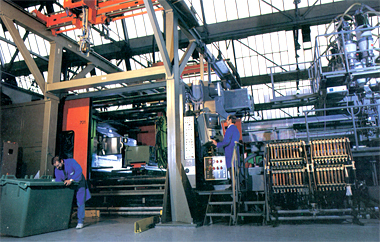 At its peak, the Group has 10 000 employees and manufacturing in 14 countries, with shares listed on the exchanges in Stockholm, London (1983) and Paris (1989). The diversified business is held together by its extensive know-how in chemistry, as well as internal production of raw materials, primarily formaldehyde and binding agents. Perstorp invents the laminate flooring called Pergo. The well-known square solid garbage cans.